Did he? Did Rob call you this morning anxious to begin your love affair? I figured. Cuz there’s nothing that turns on an actor more than girls showing up to a co-star’s band’s show wearing Twilight T-shirts, showing off their Twilight tats, swinging their home-made Jasper handbags over their shoulders, wearing a monkey hat, carrying around a huge stuffed monkey and asking when “Jasper” is going on stage. How ever will Rob chose between you all? Last night was amazing. Big hugs to all the LTT/LTRs I met. Real recap to come this week. It’s 2:16 am and I need my beauty rest if I am going to be at my best for Rob’s call in the am, declaring his love for me since I saw a show tonight where the lead singer happened to be in two movies with him and they may or may not be friends outside of work. I hope that tattoo is a tribute to “bella”. I like to think she has a friend/aunt/cousin/sister/daughter/ lesbian lover named bella that died and therefore this tat is in memory of said bella.otherwise girlfriend has lost her marbles, it can’t be her name it would make no sence for someone to tattoo their own name on themself.sort of reminds me of when I worked in childrens church and when we would label the kids with a sticker nametag we would put it on their backs so they couldn’t tear it off and we could remember their names. * I’ve never wished for the death of someone I don’t know more than Im wishing for it now.chances are this is a twilight tattoo why else would she feel the need expose her entire back to show it off. If i know Rob the way i think i know rob im certain he would be so into this and uber impressed with your committment towards his fictional love. a few things, one, if you expose your back it should be less pock marked and covered with creepy fan girl tats. Two, when attending shows with friends-o-my man in them, cover your crazed fangirlness, it’s scares away the reason we all came, oops, I mean it freaks out the band. 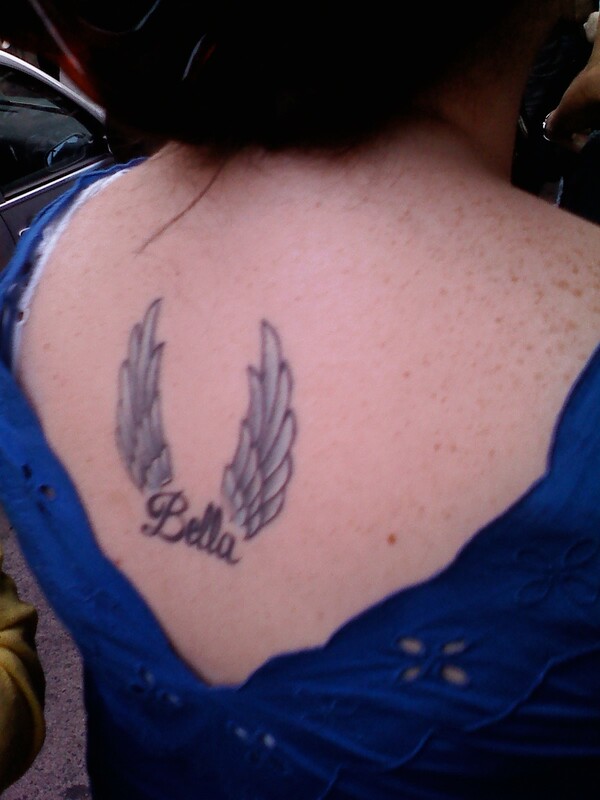 I made the mistake of enlarging the Bella/Wings tattoo. Please don’t do it if you haven’t already. Nightmares for a week I tell ya. Now you know I had to do it….just cause you said don’t. @brummielover–I had to do it too. Why? Why? Why? I enlarged the monkey girl, too. Is the monkey in a banana peel? I don’t get it. Looks like you ladies had a fabu time, cannot wait for the blow-by-blow!!! Um, UC, clearly I am impressed with your skills of posting after the night that we had. Hope you were functioning this morning. Dang, never got to take a picture with the stuffed Monkey/Banana. Oh well, I got a picture with random no-sleeves dude that clearly had no idea what the frick was going on. Okay, off to feed the hangover! my friend got a picture with the banager (sp?) with his hood up. i sent the picts to uc. Love the way monkey woman was in banana yellow……As for winged Bella tatto girl….. well I think that covers it. Yea, it really doesn’t matter if tat girls name is Bella or not…she is still a HOT MESS.. If it is her name..what is she worried that her “fella” will forget and be like oh hey ummmmm, wait a sec turn around…right Bella can you bring me a beer out of the fridge…yea I don’t think so….. Honestly, is it any wonder we take the pi** out of Twilight and ourselves? We are the YING to the YANG that is twilight insanity! I can’t wait for the detais on this concert! I mean, it must have been so difficult for Jasper to keep himself from lunging into the audience and sinking his teeth into the fangirls to assuage his bloodlust. I hope the pictures show his pained expression as he fought to control the emotions of the horny girls in the crowd. Did Alice make a guest appearance, to help calm him down? I hope so. Do all of his scars show up in the dim light of the club? There are just a million and one questions that only you can answer. i had so much fun with you girls! i just woke up. ROTFLMAO. UC, you are the HOT stuff shizz. Will I get a call too, you know since you will get the call from Rob any moment now and I am your biggest fan. Why, you ask? well, you went to the show, run a web blog, have a public email id and possibly may get replies from Rob pretending to be a 22/23 female blog fan. Im just saying if he calls , tell him to call me too? i will definitely do that. I can share the Rob love! thats freaking hilarious in a omg thats so freaking stupid sort of way. I wish I could have been there to take pics and laugh at everyone with you! oh and of course to have a chance at robs heart, cause I so know thats how its done. bahahahaha. Even if her name was Bella, the tattoo would remain silly. What kind of person gets their name tattooed to them?! But, hey, at least the girl put a tiny ounce of thought into her tattoo, rather than getting a four-leaf clover or generic butterfly while drunk as a tramp-stamp. No, that tattoo IS Twi-related. You know she probably wore that shirt and cut her hair so people could see it. She went to the front waiting for Jacksper to come out and she would dance turn around hoping he would see her tattoo and say “Hey Darlin, is that a twi-tattoo you got?” She would say “You betcha”(trying to look cute with a fake southern accent) This twi-tattoo lady was hoping that her and Jacksper would fall in love and whenever she got too cranky, he would just touch her and she would calm down, cause she had such a bad temper. You know that Jacksper actually has calming and exciting(that’s what she said) ability. you are our twi-tattoo expert..
in fact.. you sound like SUCH an expert that…. you have one yourself, don’t you!? what’s it say? “I <3 LTT?" UH……..no. I am no crazy fan girl that tattoos a rpattz signature on her wrist that is from a poster(LAME) And I don’t (thank goodness) own a pair of pattinson pants that I wear in front my other twilight friends to show them I love rpattz the mostest. I am however a LTT/LTR reading lady(*snort*) that reads your blog daily and laughs and pees her pants(not really….well maybe) everytime she reads the posts. Okay…cough up the Monkey. I want it! *unpacks stuffed monkey from bag that’s going to TwiCon* anyways, sounds like you girls had a blast! I can’t wait to see the other pics you all got. I am kind of sad I will be seeing Jacksper @TwiCon b/c now I def won’t be able to tell who is legit b/c the whole thing is Twi. I will admit now that I am caving into peer pressure and only going b/c i want to hang w/my LTR peeps Myria101, JoBenDes,Momof3CrazyKids etc. I have not heard/listened to any of the music yet. I want to go in fresh….virginal if you will! Oh my! From the sound and look of things, the people watching must have been fantastic! Give me a drink, sunglasses (if outside) and a comfy place to sit, I could be entertained for hours! The best places, your local state or county fair, theme parks, and now a Twilight T-shirt infested co-stars concert. Good times! Can’t wait for the recap! Jackson is a great actor. And that’s all I’m gonna say, lest the haters get going. Girl, you ROCKED IT last night. Your outfit, I mean. Not the music. i love you uc for all reasons known and unknown. rob woke up and told me he loved you too because he heard you went to this show. he’s sending you a stuffed banana in the mail. Have you googled ‘Twilight Tattoo’s’ …?? I am slightly afraid of permanently expressing my love of the Twilight series…. I don’t know if when I’m 50, it will have the same affect. And the banana women with the monkey, also scared me. Just a little. But the banana woman is a Brazilian au pair and she’s absolutely adorable and super-sweet. 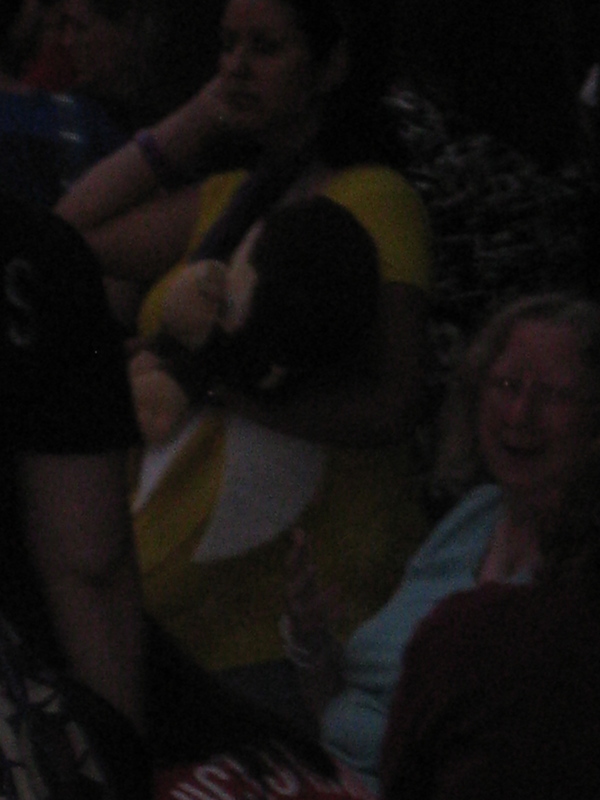 If anything, she deserves mad props for willingly carrying an oversized curious george(?) into a sweaty, smokey, stuffy sardine can that was the Khyber, not once but AT LEAST twice! Cuz there’s nothing that turns on an actor more than girls showing up to a co-star’s band’s show wearing Twilight T-shirts, showing off their Twilight tats, swinging their home-made Jasper handbags over their shoulders, wearing a monkey hat, carrying around a huge stuffed monkey and asking when “Jasper” is going on stage. =O) THANK YOU SO MUCH!!!!!! No, my boss is very nice and understanding but (seriously) one of these days you are going to make me fall off my chair laughing and I will end up in the hospital or something. And then my boss won’t be very happy. We have a zero accident record and he will have to answer a lot of people if someone gets injured. So if I get fired I will hunt you down and kill Little Edward and burn all your Twilight stuff down to ashes so you can’t put it back together. P.S. : anxiously waiting for your recap. oh we stood in front of her and pretended to take pics of ourselves.. but in fact where taking pics of the tattoo! I was right behind that tattoo! I was like I hope her name is Bella. I had so much fun and the 100 Monkeys put on a great show! We dubbed the bass player of The National Rifle as Likable Hot Guy! Suppose to read LICKABLE Hot Guy! Everyone in my crowd wrote him off as an unfortunate attempt at embodying Flea. His pants fell down during the 3pm show, but the male lead said the bassist thought it’d be comical to intentionally drop them Saturday night, and then actually write advertising for TNR on tightie whities for his final pants-dropping Sunday. Idk. I guess I dont have his sense of humor. That, and he kept flingin his sweat all up in us like we wanted a piece of him. yes! i’ll include that in my recap! Oh UC I was standing right next to Jackson as he entered the door to get on stage! Did you dance with the banana? who would get her dance up all over him? I wonder!